Software Developer Charles Simonyi is set to visit the International Space Station aboard a future Soyuz spacecraft. FormerMicrosoft software developer Charles Simonyi is set to become a spacetourist for a visit to the International Space Station (ISS), the orbital tourismfirm Space Adventures said Monday. Simonyi, a58-year-old American and co-founder of Intentional Software Corp., will ride aRussian-built Soyuz spacecraft to the ISS for a one-week science mission aboardorbital laboratory, Space Adventures said, adding that a contract for thespaceflight is in hand. The Russiannews agency RIA Novosti also reported today that Simonyi had signed apreliminary contract with Russia's Federal Space Agency for a Spring 2007 spaceflightthough the Virginia-based Space Adventures did not specify a target launch datein their statement. Simonyi'sflight, however, must wait until after the planned September 2006 launch ofJapanese entrepreneur Daisuke Enomoto,who is currently trainingto rocket toward the ISS with the Expedition 14 astronaut crew later this year.Enomoto's space station visit was also brokered by Space Adventures. "Like withany long term plan, I had to make reservations," Simonyi said in a statement. "Alot of training and work remains to be done before such a flight can be consummated." Simonyi hascompleted a preliminary training regime and undergone medical examinations toqualify for a Soyuz ride to the ISS, Space Adventures said. 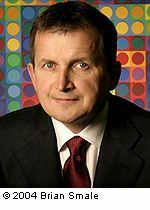 Born inBudapest, Hungary, Simonyi joined Microsoft in 1981, where he served asdirector of application development, chief architect and ultimatelydistinguished engineer, according to his corporate profile. He studiedengineering mathematics at the University of California at Berkley before earninga doctorate in computer science from Stanford University. Simonyi co-foundedIntentional Software Corp. with Gregor Kiczales in 2002. Space AdventuresCEO Eric Anderson said Simonyi is an accomplished pilot and well-versed in aviationand aerospace technology. "I have alwaysdreamed of the wonder of spaceflight and the exploration of space has alwaysinspired me," Simonyi said, adding that he believes in the pursuit of ever-moreaccessible commercial spaceflight. "I consider my future flight to be a smallpart of an important trend to make space accessible to more people, not just toexperts." SpaceAdventures has brokered ISS-bound flights for American businessmen Dennis Tito and GregoryOlsen, South African Internet entrepreneur MarkShuttleworth and most recently Enomoto. Each of those private spacefarers paida reported $20 million for a 10-day spaceflight, eight of which are spentinside the space station. In additionto arranging space station flights aboard Soyuz spacecraft for those who canafford it, Space Adventures also offers jet rides aboard Russian MiG aircraftand airplane flights that simulate weightlessness. The space tourism firm isalso developing plans for $100 million trips around the Moon, andplans to build fleet of suborbital spaceships to launch from spaceports in the UnitedArab Emirates and Singapore.